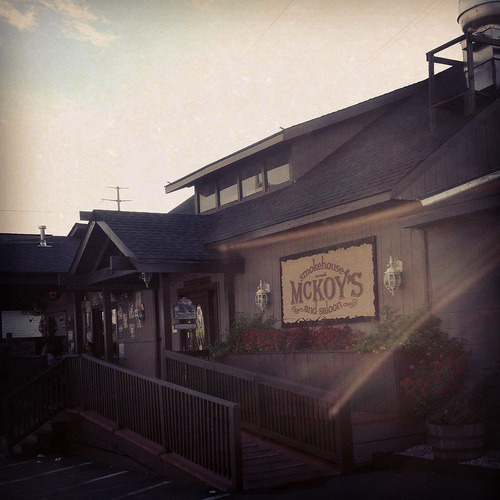 Still in search of the best barbecue in Charlotte, McKoy’s Smokehouse had actually come up in conversation with a friend a few weeks back whose co-worker recommended it to him as one of the better places in Charlotte. Not the strongest of reasons for going – “um, a coworker of a friend sorta recommended it” – but whatever we’ll go with it. Stepping out of the car, I did get a nice whiff of smoke which is always nice to see/smell as you are walking up to a joint. 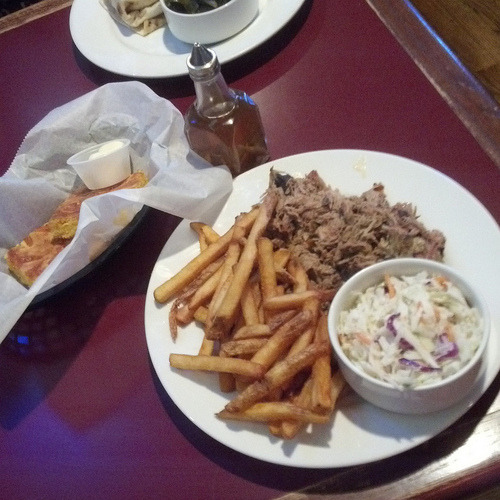 Once seated inside, I noted that there are a handful of barbecue options under the “Vittles” section of the menu – pulled pork, “award-winning” St. Louis ribs, half bbq chicken, and pit-smoked pot roast – but naturally we judge NC joints on pulled pork so that’s what I went with. 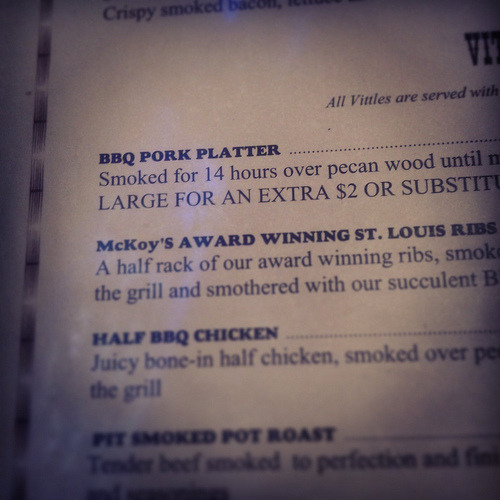 Interestingly, according to the menu the pulled pork is “smoked for 14 hours over pecan wood” which is a bit odd for NC where most places use hickory, oak, or a mix of both. The pulled pork came out moist and with nice pieces of bark but really lacked any flavor or smoke. The table sauces were a vinegar-based sauce and a thicker Kansas City-style sauce, and really the vinegar sauce worked best but still the pork just ultimately lacked flavor. The sides – mayo-based slaw and fries – were average and I really don’t need to waste too much space talking about them. 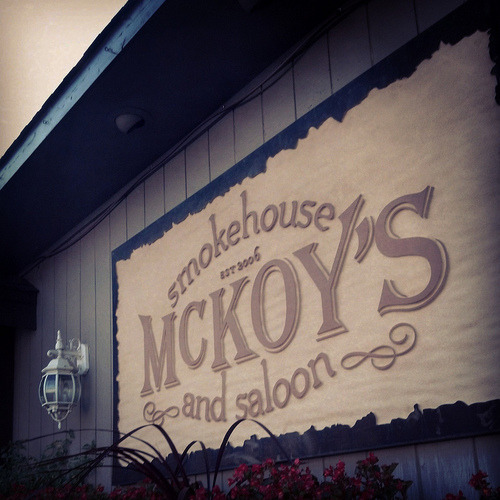 So yea, McKoy’s Smokehouse and Saloon is definitely not in the conversation of the best barbecue in the Charlotte – it’s really middle of the road at best. The decor is very much southern/biker/sports bar and grill and I could see it being a decent place to watch sports if you happen to be nearby, but for barbecue purposes feel free to head elsewhere.